The 10th anniversary of IMS Ibiza continues taking shape with the announcement of the first 10 keynotes, guest speakers, and topics that will encompass the three day conference. High-profile keynotes are always some of the most talked about engagements at IMS—who could forget last year's conversation with Erick Morillo—and this year looks to be no different, as New Order's Bernard Sumner leads proceedings. Sumner wrote the lyrics to New Order's Technique in Ibiza, so he'll likely have plenty to say about the island's impact on him and the album. Also delivering keynotes are island favourites like Dixon and The Martinez Brothers, the always outspoken The Black Madonna, Grammy nominees Masters At Work, and the Arnau family of elrow fame, who'll discuss their party's journey to global success. The Director of Media Partnerships for Facebook and Spotify’s Global Head of Dance/Electronic Music will both offer keynotes and sessions on how to best use their platforms—including a Facebook Live streaming conversation—RA founders Nick Sabine and Paul Clement will also speak, as will Italo house pioneer and Media Records founder Gianfranco Bortolotti, who’ll discuss his role in shaping Italian dance music over the span of his three decade career. Other topics and talks include Health vs. Hedonism with SheSaidSo and Native Instruments, the Diversity Debate, and the always lively Great Annual Ibiza Debate, which regularly sees some of the island’s most powerful figures convene for a rare public roundtable on the state of Ibiza. To see everything happening at IMS Ibiza 2017 so far, and to get your delegate badge so you can attend the 10th anniversary at the Hard Rock Hotel in May, head to the IMS website. Ad be sure to check out who's playing the incredible IMS finale party at Dalt Vila. 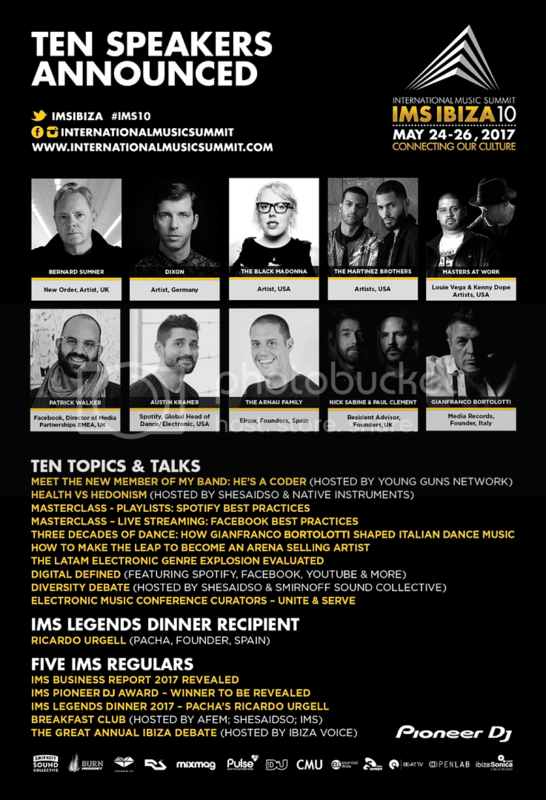 IMS Ibiza: Can You Buy Success In Electronic Music?